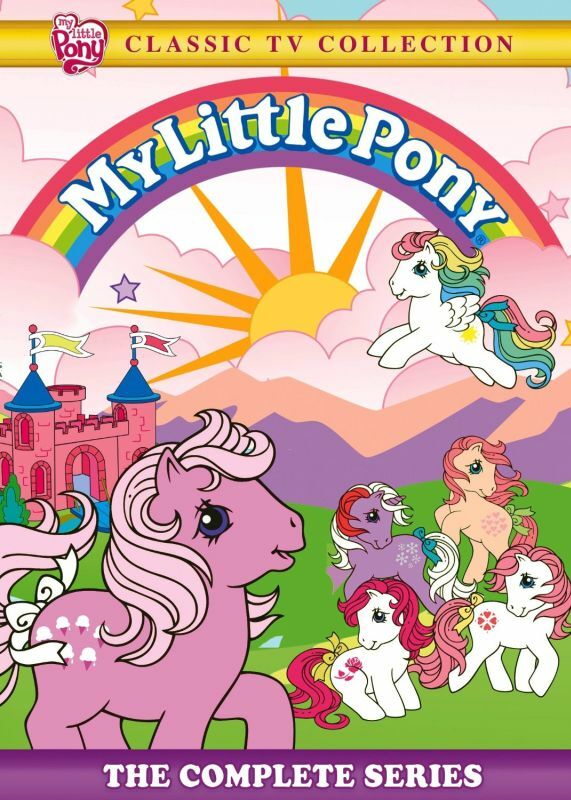 Every episode of the original, classic My Little Pony television series has been released on DVD. My sister used to watch this show so I know I've seen at least some episodes, but after watching this DVD set I have to say that this show didn't seem familiar at all. I must have purged it from my brain or something. I also have to say that I initially had a hard time watching it for two main reasons, which I'll get to shortly. But first, there were a total of 65 episodes of the original My Little Pony with each being only 10 minutes long, and that's including the 30-second opening and the end credits, so that's more like around 30 standard length episodes. A lot of episodes are multi-parters where the story spans across multiple episodes. The first reason that I initially had a hard time watching this show is that some of the voices were really annoying. The cast is mostly female, and some of them use high pitched voices for the ponies which could be quite irritating. The three witches has these really over-the-top caricature-like voices, and the voice of Queen Bumble was like both proper and whiney at the same time. There was one pony which does this kind of baby talk which I also found quite annoying. The voices improved as the series progressed, but man those first 10 episodes were tough to get through. On a side note, I instantly recognized the voice of Nancy Cartwright who voices Bart Simpsons on The Simpsons for the last 25+ years. There were other voices I recognized but couldn't place. Many episodes contain a song, and thankfully they usually aren't bad. I don't think you'll find me downloading them to my mp3 player but they're usually pretty decent and relate to what's going on. It reminds me of Phineas and Ferb since they also have songs in each episode which relate to going on, and the characters in the show do the singing rather than just having a song sung by someone else playing over the action that's going on in the show. It works in Phineaus and Ferb, and it works in My Little Pony. The stories are all pretty simplistic, which is the second reason I had a hard time watching the series. You'd think that an initial ten part episode would have a lot going on, but even with two separate groups of protagonists there wasn't really much going on and I really had to focus or my attention would wander. The stories were still fairly straightforward after that, but at least then only tended to last around 4 episodes which made it much easier to stay along for the ride. There are no extra features, but with 12 hours of episodes I think that's fine. Though this really isn't my kind of series and I'm sure I'll never watch it again, I do think this is a good release that both fans of My Little Pony and young girls who aren't familiar with My Little Pony will will enjoy. My Little Pony: The Complete Series , released by Shout! Factory, is available starting September 30, 2014.